E546: How To Become Vegan By Utilizing The Be, Do, Have Model. In today’s show I’m addressing the question: How To Become Vegan By Utilizing The Be, Do, Have Model. To Be, before you Do and before you Have is an approach I unconsciously utilized when I first became a personal trainer around 12 years ago. If you’ve been struggling to get adopting a vegan lifestyle (or any big lifestyle change) to stick then there’s a fair chance you’ve been diligently focusing on the do. It’s a tempting yet frustratingly ineffective approach to take. I’m absolutely speaking from experience. To do is my natural inclination. It feels good to do! It’s exhausting. It’s very reliant on discipline. You’ll never get it all done. There will absolutely be opportunity costs so far as what you’re missing out on while you’re do, Do, DOING! Resentment is likely to build. Even worse than an approach of Do, Be, Have is to fall victim to the Have, Do, Be mindset. More time. More money. More information. The Have first focused person is at the mercy of exturnal factors. They lack personal responsibility and suffer from excuse-i-tis. As such they also lack control and they are never satisfied. The Have first person is rubbish at gratitude. The thing they’re good for? Being an anti-mentor! That’s enough of todays show wasted on the unhelpful “have first” approach let’s get into How To Become Vegan By Utilizing The Be, Do, Have Model. So far as BEING: The first question to ask yourself is: Who do I need to be? This helps you get clarity so far as the results you desire. So for example, and I don’t know exactly why or how I knew to do this however I have a vague recollection of hearing that I should decide what sort of personal trainer I wanted to BE. I decided I would be the most: Positive. Focused. Energized trainer. From there the actions / the doing were really simple and clear: I’d choose my mood every day as I walked into the gym. I’d give my clients my full focus every second of every session. I’d eat and train to be fit, strong, healthy and if I didn’t feel 100% I’d fake it till I made it. The thing I’ve learnt is that so far as How To Become a Fit, Strong, Healthy Vegan, it’s NOT about the delicious vegan meals and the vegan shoes and cosmetics. Those doing actions are the easy bit. Ok maybe not the shoes so much – where are the gorgeous yet non Stella McCartney priced vegan shoes?!!! I digress… the being mindset is what makes the doing actions easy and sustainable. The type of person who values LIFE (and health and the environment) over taste and convenience. Also the type of person who aligns their actions with their beliefs. Absolutely the person who never starts making excuses. Because once you start, where do you stop? The type of person who takes the right action rather than the easy action. Who sees food as the chance to GIVE your body the best possible fuel to support and nourish it. Absolutely the person who sees animals as friends not food. The type of person who focuses on the big picture and long term goals rather than a quick fix or instant gratification. Who recognizes everything counts and values constant improvement and consistency. Absolutely the person who keeps your word with YOU. So far as DOING: The next question to ask yourself is: Being that kind of person, what would I be doing? One. Decide on the strategy that sounds doable for you. Perhaps you’ve just watched a documentary like Earthlings or What The Health and you’re down with cold turkey (cold tofu!). Or maybe that sounds daunting? All good. Decide on one meal group to veganise first: like Breakfast. Or one animal product group to replace first: like Meat. Even start with vegan at home. Or vegan Monday to Friday. Everything counts. Two. Remove the pressure by deciding on a timeframe that works for you. If you started with breakfast first or replacing meat first then maybe after a week or few you sort that next meal or replace that next animal product group. If you’re going cold tofu and you’re 100% committed that’s amazing however I’d still recommend deciding on a period of time to check in after and see how it’s working for your body. Either 30 days, 3 months or a year. This is not the point where you declare “this is too hard, I give up!” it’s just a place to check in and see if there are upgrades to be made. Hint: there are always upgrades to be made! Perhaps you haven’t sorted any supplementation like B12 or algae based Omega 3’s in the first little bit. I didn’t for 2 years and my bloods came back normal however I now take them both because I found the time to research them and enough people I respect recommend them. Maybe you started with a heavy reliance on bread and a few months in you’re ready for more one ingredient upgrades. Possibly in the early days you used the money you were saving on expensive meat to buy expensive dairy free pesto and vegan cheese and 6 months in you’re up for making your own? Alternatively maybe in the early days you diligently washed all your organic leaves / berries and now it’s worth the time saved to just buy frozen? Maybe you’ve lost a little weight or gained a little weight and it’s not what you want! It’s fixable. You likely took years to refine the animal eating strategies that worked best for your body. It won’t take as long to refine your healthy vegan eating strategies as there’s so much less rubbish to have to avoid and so much more goodness to get to enjoy. Three. Schedule regular motivation / support / “WHY am I doing this?” doses before you need them. It’s amazing how easy it can be to slip back on your blinders and get steadily, stealthily deceived by the clever marketing of big animal agriculture. My social media accounts are full of the atrocities we humans inflict on animals and as disheartening as that can be it also means I will never ever get complacent or mind-numbed to the pain behind any piece of animal flesh, skin or excretion. I also make time each week to watch animal activist videos on You Tube.People like Earthling Ed and Joey Carbstrong. If heath is your main motivator I recommend setting aside time each to read How Not To Die or Eat Like Your Care and of course to check out the videos on Dr Michael Gregers site org. Find a group that shares your values and is a place where you don’t need to constantly explain your choices. They just get it. Either online or if you can a volunteer group like Anonymous for the Voiceless who do vegan street outreach and have over 600 chapters around the world. Schedule time with the friend that just get’s it and equally be cognizant of too much time spent with people who question your choices in a way that just leaves you feeling rubbish and drained. Four. Make time for some of the things that were most important to you before you became vegan. When you are regularly entrenched in the hugely compelling reasons behind why you became vegan it can make all the other important things in your life seem less important. I see this happen with other vegans and especially activists and I notice the potential for this in myself. Time on other hobbies / being creative / reading about non animal rights issues. One: Rather Than One Main Event, focus on building your meals around fibrous veg, plant based protein and good fat. Further to this, your plant based protein will come from multiple sources in one meal (not just one hunk of animal protein). Three: Buy Quality Produce and give it the same cooking, seasoning, marinating respect you gave meat. So the goal is to treat your veg the opposite of those boiled to death brussels we forced down (or just moved around the plate!) as kids. Four: Don’t Be Disheartened By A Recipe Flop! You’ve had plenty of bad meat meals over the years right? It’ll take a little a patience to find your winning plant based recipes. Five: You Might Have To Eat Larger Meals To Be Satisfied. 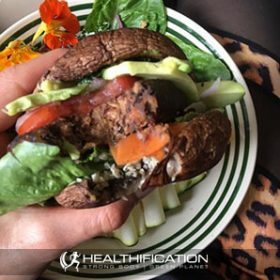 Animal products generally have a high caloric density so the quantity you can / will need to eat when it’s purely plant based will go up. Further more, do not be scared of good fats: nuts, seeds, avocado, quality oils… once you cut the poor quality fat out of your life you’ll be able to enjoy A LOT more good quality fat. Six: Find Creative Alternatives For Those Meals You Used To Love As A Meat Eater. Instagram is my favourite inspiration here. There is literally a vegan version of everything. Up your insta-inspiration game by experimenting with switches that make your meat-make-over meals lower carb and higher protein. Seven: Find Plant Based Protein Pimps To Add To Any Meal. Aside from nuts and nut butters how about: Hemp seeds. Pumpkin Nutritional yeast. Dulse flakes. 4 Bean mix. Edamame. Eight: When Eating Out Scan The Menu For Easy Additions To Your Meal. Know that the more often you politely ask for vegan options the more swiftly decent, delicious, satisfying plant based options will become a part of the regular menu. Nine: The More Certain YOU Are Of Your Choices The More Accepting Your Loved Ones Will Be. They follow your lead. Ten: Everything Counts. Move at your own pace. Know there is not such thing as failure or a “bad vegan” AND do it for YOU at the right time for you. It’s up to YOU. There’s not right or wrong, it’s simply about what feels congruent and sustainable for you. What are the values, the beliefs, the standards and the non-negotiables that come to mind when you think of the person you first need to be, before you do and before you have? The Healthification podcast is proudly bought to you by my FREE ‘Easy Vegan’ plan. It took me 25 years to transition from a meat eater to a happy, healthy, non-judgemental Vegan! You can do it in just 3 days with my simplified ‘easy vegan’ plan! Get the fit, strong, and healthy plant based body you deserve… while avoiding ALL the mistakes I made along the way!